Was Mrs. Rayburn Too Hard on the Beaver? The Halsey Hall Chapter Research Committee is conducting another On-line Baseball Research Tools Panel Presentations workshop, at 7:00 p.m. on a Monday in March (March 11 is the first choice, but March 18 is a possibility, too) at the University of Minnesota. The workshop, which will be open to the public, will demonstrate on-line baseball research tools, including those listed in the chapters Baseball Research Primer. A tentative list of presenters includes Kenny Jackelen, the primary developer of baseball-refererence.com, who will give an overview of the site, and S. Thornley, who will do the same on Retrosheet. Bob Tholkes will show the research potential in Protoball, Jim Cox will demonstrate resources at the Library of Congress, Tom Flynn will demonstrate on-line newspaper research, and Dan Levitt will present something fascinating, as he always does. In advance of the event the committee will hold a regular meeting on Monday, February 11 at 7 p.m. at Brookdale Library, 6125 Shingle Creek Parkway, Brooklyn Center 55430. All members are welcome to attend. 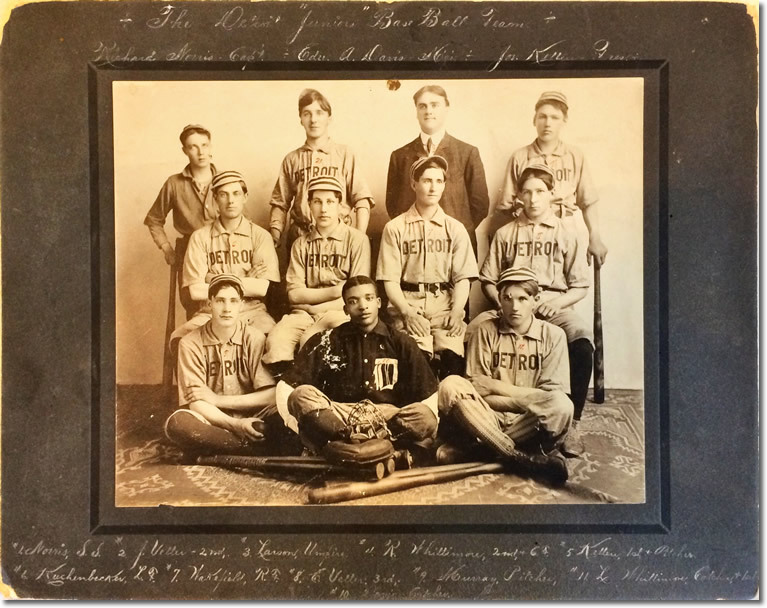 The chapter research committee helped Jared Whittemore of Colorado track down information on his grandpa, Richard Whittemore, who is in the above picture on a Detroit (now Detroit Lakes), Minnesota, baseball team around 1908. The committee found information about Richard and his brother, Lon, in the Detroit Record, including a picture from their high-school from their graduation from Detroit High School in 1907. One of the names visible on the above photo is of a star player named Kuckenbecker, who was missing from a June 1908 game because he had a boil on his whatchamacallit, but the names of Kuckenbecker and Whittemore turn up in a box score (pieced together in a crooked manner below) from a July 4, 1908 game. Jared was happy to get information on his family members and is continuing his research from afar. Another interesting aspect of the team photo is that it contains a black person. Details are set for the Minnesota 19th Century Base Ball Interdisciplinary Symposium, which our chapter will host in Minneapolis on Saturday, November 16. Bob Tholkes is the primary organizer and is working with the chapter Research Committee on the program. Gene Gomes has secured the Minneapolis Central Library as a collaborator in the symposium with one of the benefits being the use of the Pohlad Auditorium in the library for the event. Bob said he expects John Thorn, the historian of Major League Baseball, to speak, along with Kristin Anderson, Rich Arpi, and others. The Halsey Hall Chapter 2019 Spring meeting will be Saturday, May 18 at Faith Mennonite Church, 2720 E. 22nd Street in south Minneapolis. Registration for the meeting is at 8:30 with research presentations beginning at 9:00. A business meeting will be held during lunch with a featured guest to follow. The cost for the meeting and lunch is $10. The meeting only is $5. Those wanting lunch must RSVP to Howard Luloff, 952-922-5036. Members are invited to submit a proposal to make a research (oral or poster) presentation at the meeting. Proposals must be sent to Research Committee co-chairs Brenda Himrich or Sarah Johnson and include a title and brief outline of what the presentation will consist of with emphasis on the research that will be included. Standard oral presentations are 20 minutes (with an additional eight minutes for questions) although the duration may be longer or shorter depending on the needs of the presenter and of the schedule. The Research Committee (which also consists of Dan Levitt, Jim Cox, Doug Skipper, Stew Thornley, Rich Arpi, Dave Lande, Anders Koskinen, Gene Gomes, and Bob Tholkes) will finalize the schedule of research presentations by May 4, two weeks before the meeting, so proposals must be submitted by then. During the business meeting, the chapter will elect four members to a two-year term on the board of directors. Anyone interested in being a candidate may contact nominating committee chair Stew Thornley, 652-415-0791. The Halsey Hall Chapter will again have a table at Twinsfest at Target Field from Friday, January 25 to Sunday, January 27. If you are interested in volunteering for a shift at the table, contact Doug Skipper, 612-876-1408. A Caribbean Series viewing party will be Sunday, February 3 at 2:00 p.m. at Adelitas Mexican Restaurant, 2405 Central Avenue NE, Minneapolis 55418. The Halsey Hall Chapter Book Club will meet Saturday, February 9 (on the second Saturday rather than the customary first Saturday since book club czar Art Mugalian will be grinding his hog on February 2) at 9:30 a.m. at the usual spot, Barnes & Noble in Har Mar Mall in Roseville. The book selection is Powerball: Anatomy of a Modern Game by Rob Neyer. 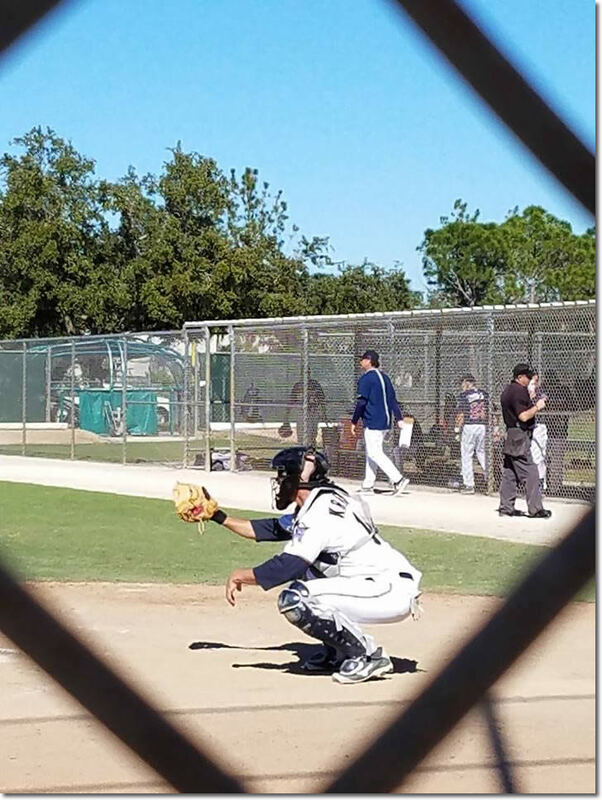 The next Fred Souba Hot Stove Saturday Morning, an informal breakfast gathering for the purpose of talking baseball, will be at 9:00 on Saturday, March 2 at Bunnys Northeast, 34 13th Avenue NE, Minneapolis 55413, 612-545-5659 (in what was the keg warehouse of the Grain Belt Brewery). Join your fellow fans to talk baseball at Grumpys Bar and Grill, 2200 4th Street Northeast, Minneapolis 55418, on Friday, March 22. Gathering begins at 5 p.m. and continues as long as people can walk a straight line. 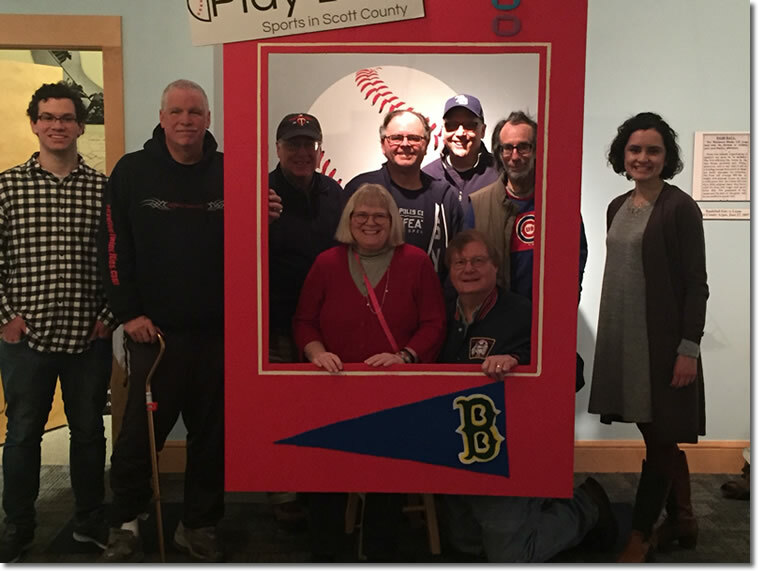 Jim Cox organized an outing to the Play Ball! Sports in Scott County exhibit at the Scott County Historical Society January 12. The Halsey Hall Chapter welcomes Ann Huidekoper, Thomas Merrick, and Jeff Schwartz. Andy McCue announced that the end of the year update for The Baseball Index contains almost 1,500 new entries. That brings the total to 256,134 citations of articles, books, essays and other materials that can serve as the basis for your research into baseball history, Andy reports. Andy points out that volunteers are always welcome. Contact Andy McCue if you can help. The Northwoods League needs people to operate their statistics and data systems and to write game recaps. If you are interested or want more information, contactleague president Matt Bomberg. Looking for a keepsake? Bill Axness is downsizing and looking for a good home for the nice 1969 Macmillan Baseball Encyclopedia, the original Big Mac. Contact Bill if you are interested. David Karpinskis Baseball Roundtable blog was rated number 58 in Feedspots list of top 100 baseball blogs. You can also follow Baseball Roundtable on Facebook and Twitter. 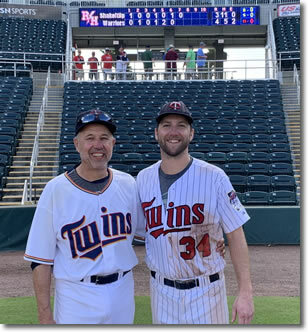 Lloyd Kepple attended his seventh Twins Fantasy Camp and the fourth in which he played with his son, Ben. The Kepples were part of the champion Warriors, coached by Phil Roof and Matthew LeCroy. Helped by the pitching, catching, hitting, and running of Paul Kotch Kratoska (a fraternity brother of a Halsey Hall Chapter member), the Warriors beat the Shakers 4-3 for the Blue Division championship. In the title game, Kotch raced home from first on a double to score the eventual winning run. Left: the Kepples (Ben is the good-looking one). Right: Paul Kotch Kratoska, former star of the Delta Upsilon Wheels. Frank Jude by Terry Bohn. Almanac Singers Visited Duluth in 1941 by Anthony Bush. September 19, 2004: Twins Johan Santana Strikes out 14 en Route to First Cy Young Award by Sarah Johnson. Jim Cox spent time at the Minnesota Historical Society researching Minnesota Native American and African American baseball in the 19th century. 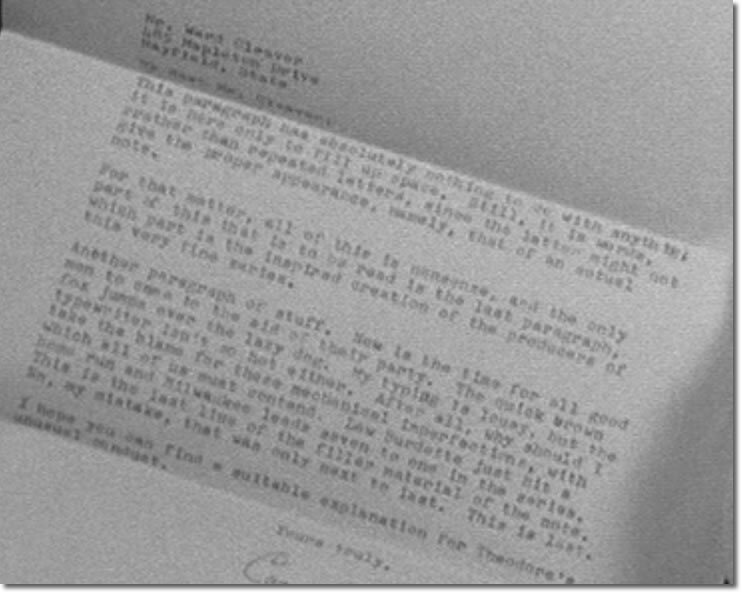 An article on Me TV, Leave It to Beaver Hid Jokes and Baseball References inside this Letter from the Principal, shows a letter to Ward Cleaver from principal Cornelia Rayburn after Beaver called Linda Dennison a smelly old ape. The ME TV article points out that Burdette hit this home run in the bottom of the first inning of the second game of the 1958 World Series. The game was on October 2, and this issue of Leave It to Beaver aired November 6. The Braves won this game 13-5 to take a two-game-to-none lead, although the Yankees came back to win the World Series, four games to three. January 25-27Twinsfest, Target Field. For more information, contact Doug Skipper, 612-876-1408. February 3Caribbean Series Viewing Party, Adelitas Mexican Restaurant, Minneapolis, 1:30 p.m.
February 9Book Club, Barnes & Noble, Har Mar Mall, Roseville, 9:30 a.m., Powerball: Anatomy of a Modern Baseball Game by Rob Neyer. February 11Research Committee meeting, 7:00 p.m., Brookdale Library. For more information, contact Brenda Himrich, 651-415-0791, or Sarah Johnson. March 11 or 18On-line Baseball Research Tools Panel Presentations, University of Minnesota, 7:00 p.m. For more information, contact Brenda Himrich, 651-415-0791, or Sarah Johnson. March 2Fred Souba Hot Stove League Saturday Morning, Bunnys, Minneapolis, 9:00 a.m.
March 22Pre-Draft Grumpys Gathering of Baseball Enthusiasts, 5:00 p.m., Grumpys Northeast.